R.R. 3, Wallenstein, Ontario. Located 1.5 km east of Wallenstein at 7188 Line 86. Bishop Abraham Frey served in 1986 as a non-salaried congregational leader. In 1925 there were 64 members; in 1950, 89. The congregation has been affiliated with the David Martin Old Order Mennonites (now known as the Independent Old Order Mennonite Church). The language of worship is German. The congregation began services and formally organized in 1917. The first building was occupied in 1918. David W. Martin is considered the founding leader of the group. The congregation originated through division from the Peel Old Order Mennonites over a desire for stricter discipline and doctrine. Epp, Marlene. "Wellesley Independent Old Order Mennonite Meetinghouse (Wallenstein, Ontario, Canada)." Global Anabaptist Mennonite Encyclopedia Online. April 1986. Web. 24 Apr 2019. http://gameo.org/index.php?title=Wellesley_Independent_Old_Order_Mennonite_Meetinghouse_(Wallenstein,_Ontario,_Canada)&oldid=163755. Epp, Marlene. (April 1986). Wellesley Independent Old Order Mennonite Meetinghouse (Wallenstein, Ontario, Canada). Global Anabaptist Mennonite Encyclopedia Online. 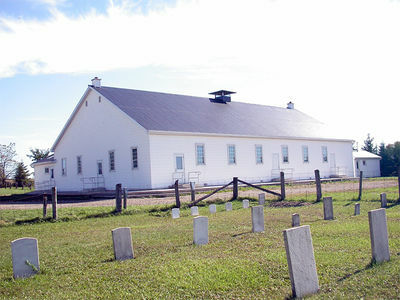 Retrieved 24 April 2019, from http://gameo.org/index.php?title=Wellesley_Independent_Old_Order_Mennonite_Meetinghouse_(Wallenstein,_Ontario,_Canada)&oldid=163755.